Situated in Karon, this condo is within a 15-minute walk of Kata Beach, Karon Beach and Kata Porpeang Market. Kata Noi Beach is 1.6 mi (2.6 km) away. Room is clean. Bed is comfortable. But nothing’s around the area for shopping. While we were there they were running a special on in-room massages. We had a massage in our room almost every night. The location is in a more secluded area than the other hotels in the area so it was really quiet. If we ever go back to Rawai we will 100% be staying at this property again. The whole place really felt like home, i'm vey happy to stay. Lovely stay and we had a wonderful time in Dcondo mine! A well sustained one bed room studio with all the amenities we need. Fast internet, hot shower and nice view outside the bedroom. 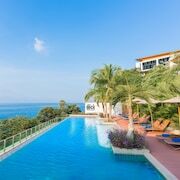 More, we love the infinity pool, perfect for spending time relaxing! 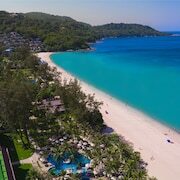 Situated in Rawai, this condo building is within 2 mi (3 km) of Rawai Beach, Nai Harn Beach, and Chalong Bay. Promthep Cape is 2.2 mi (3.5 km) away.